On Friday March 23, Grade 8A raced their CO2 Dragsters in the cafeteria at St.Joseph’s High School. Mr.Mulvihill’s grade 8 class has being participating in the tech explore block for the last 6 weeks. They have been creating CO2 drag cars from scratch throughout these weeks. There was many steps in creating these cars. First, students had to design what they wanted on paper, next they were given a block of wood and had to drill holes with the drill press. Next, they ad to draw the side and front views on the block of wood, carve it out and sand it down for a few days. After it is totally sanded out and completely smooth, you can paint your car. The next step is to create the stickers you want to appear on your car, then you print them and stick them on your car. Finally, you add the wheels and your car is finished. “Our favourite parts about creating these cars were decorating and racing.” said two students Peyton Gray and Ryan Kelusky. They did a practice run on Thursday March 22, to test out their cars and prepare for the real race the next day. The cafeteria was full of excitement on Friday. Mrs.Dickerson took the win out of all the grade 8’s, grade 8 teachers and Mr.Trainor. Ryan Kelusky took second place after having to tape his car back together because it didn’t make the practice race. Tech teacher Mr.Charkavi wanted to do this project with the students because they really get a chance to explore what the tech course is like and it is a fun activity to learn and experience. New students are entering the tech explore block and are excited to get started. With a new school year beginning you can expect to see many new students walking through the front doors of St. Joseph’s High School, the majority of those students being in grade 8. On September 5, 2017, 83 new students started their high school journey. Thrilled about a fresh start, these students couldn’t wait to see what was in store for them. These Jags, unlike many other students in similar circumstances, were not nervous to begin high school. Thanks to the annual barbecue orientation, students knew who their teachers were, where their lockers were located and what classrooms they were in beforehand. Students felt far more prepared for the first day. With approximately 600 students enrolled in St. Joseph’s, plenty of grade 8 students felt this was the place to be. Appreciating all the programs offered by St. Joseph’s; such as Jag Media, the Hockey Skills Academy, Student Council and Art Club, students are able to discover where they fit in. The grade 8’s, led by Mme. Clarke worked together to raise money, toys and other items to make this Christmas Angel tree for 3 children in Renfrew. 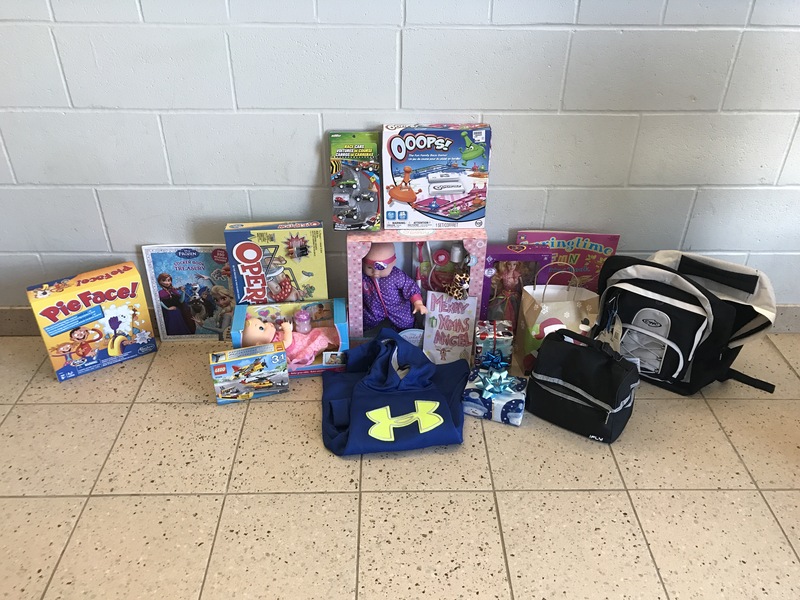 The items below were brought to the Salvation Army by Mme. Clarke. They were all asked to bring in a loonie or toonie and raised $37.50. Some students brought in a backpack, under armour sweater, and lunch kit! Good job guys! Moving from elementary school to high school is scary and exciting. The transition is huge! Everything is a lot bigger, and there is a lot more kids in your new school that you might not know. But don’t be scared, everyone has made that transition before, and the pros outweigh the cons. We talked to the grade 7 class at St. Thomas the Apostle Elementary School. When we asked them how they felt about coming to St. Joes, they’re overall reaction was “I can’t wait to get out of this place!”. But beneath that, they’re still scared-and that’s normal! One girl said “I’m afraid of what people might think of me”. In life, you will often be put in tough situations, and you will be afraid of getting judged, but at St. Joes, you’ll make so many new friends, and all of those fears will disappear. Once you settle in, it’s a great environment and you will love it. Every hand went up when they were asked about extra curriculars. A lot of kids wanted to play sports, join the musical or the choir. Whatever your interests may be, you’ll find something you love here. We wish all future jags good luck on their transition from elementary to secondary school, you’ll love it here! The Jag Hunt: High intensity high anxiety. Everyone in the school (including teachers!) is paired up. The goal of the game is to clip your partner with a clothes pin when they aren’t looking. We talked to young jags Marcus Legnaro and Abigale Visinski about their first Hunt. “It’s pretty intimidating being matched up against older students that we don’t know, but it’s a lot of fun.” Said Abigale. Her and Marcus both moved on to the next round. Good luck guys! Grade 8 Flag Football Tournament. On Wednesday October 12, our grade 8’s participated in the annual flag football tournament at Mateway. They played well, but unfortunately couldn’t compete with the other schools. The Jags started off their day playing against Eganville District Public School (EDPS). They got off to a very slow start, and were not prepared for the strong running offence. In their second game, they played against the eventual winning team, RCIS. The Jags started to figure things out in the second half of this game, but it wasn’t enough in the end. The final game of the round robin was against McNab. This was a close contest, with all the young Jags getting some quality playing time.